Essential Tools for Producers including Monofilter, Visualizer, Stereoizer, Stereoplacer, MasterCheck, ISL & SEQ 5. Low Frequency Manager Sharpen, define, align and anchor your bass. When solid or natural sounding bass is a requirement in your recording projects, Monofilter provides the foundation for real power and definition. Visualizer gives you indispensable audio analysis for quality audio production, with a standardised reference set of professional tools that let you work faster, avoid mistakes, repeat past success and leverage the success of others. All this is managed through a unique, intelligent window system. 21st Century Pan Control Frequency specific stereo placement using unique stereo positioning technology. Precise control you just can’t get within a traditional mix setup. Choose the position you want, and Stereoplacer will preserve the balance of the original sounds. Immediately reveal how the consumer will hear your productions on todays music platforms. Mix and master to target and the quality of your audio will be assured all the way to the consumer with no nasty surprises after release. 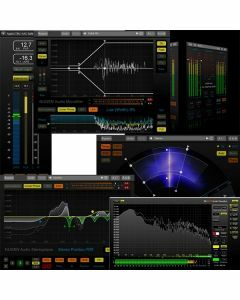 MasterCheck gives you the tools to evaluate your work and seize the competitive advantage by producing directly for the playout environment, allowing you to effectively utilise maximum dynamic range without compromising on loudness or risking distortion introduced by mp3 or AAC compression. World class, broadcast-quality limiting, essential for any audio production. It’s never been quicker or easier to ensure top quality sound and standards compliance. ISL is a transparent look-ahead limiter designed to allow you to get on with creative audio production while it takes care of true-peak compliance for you.